U.S. Currency Is Printed Using A Technique Known As? If you’ve looked at a crisp new piece of U.S. paper currency and thought that the ink almost had a depth to it, you’re not imagining things. The very crisp and subtle three dimensional looking text, images, and detail work on U.S. paper currency is actually, in fact, three dimensional on a very tiny scale thanks to the manner in which it is printed. 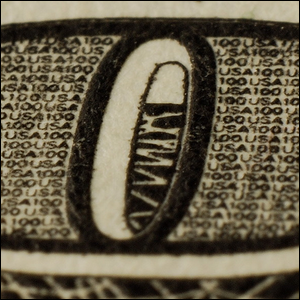 U.S. currency is printed using a technique known as intaglio printmaking. The intaglio technique begins with a carefully crafted master plate wherein the image that will appear on the final product has been precisely incised into the plate to create tiny voids for the ink to fill. During the actual printing process, ink is applied to the plate, the plate is wiped clean (leaving ink only in the incised areas), damp paper is placed on the plate, covered by a thick blanket (to ensure even pressure during the rolling process), and then rolled under pressure. When the paper is lifted from the plate, the image from the plate is slightly raised up from the paper both because of the depth of the ink and the slight deformation of the paper fibers into the plate itself. Peer at the finished product under a microscope and the inked areas look like dark mesas rising up from a papery desert. Although intaglio printing was once widely used for everything from playing cards to stock certificates, today the process (due to the high cost compared to more modern methods) is reserved largely for currency, bank notes, passports, and some high-value postage stamps.